Poltergeist 2015 is haunted by the original. A father at a low point in his life is forced to move to a new neighbourhood but their new house is riddled with angry unrested spirits. A remake of the 1982 film its difficult not to draw comparisons, it is generally entertaining yet fundamentally unnecessary. While the remake revisits and reincorporates ‘Poltergeist’s’ themes, hitting the beats as if plotted on a graph throughout, an ominous tree, the supernatural stacking of objects, an eerie clown and investigator’s visions it’s hard to pin down a single moment where it does it better. Thanks to Sam Rockwell’s Eric Bowen an everyday dad and Jared Harris in a celebrity medium role it does provide a fast paced ride, retaining the family humour of the 1982 version, however, it lacks that idealistic, innocence in contrast to the sinister side that the original Spielberg/Hooper combo provided. Writer David Lindsey’s script is fine and the contemporary monitoring equipment, including GPS locators that the investigators use and the roles shuffled highlights that with all its updates, it becomes clinical losing the organic feeling of the original. Yes some effects out do some of the optical effects of its predecessor but not many. Even with a solid supporting cast and Sam Rami on board as producer with the likes of Sinister, Insidious, Conjuring to name a few doing the rounds it’s odd why anyone would want to remake Poltergeist in the first place. Following the template of the first, with slight of hand, the ending dispiritingly borrows elements of the 1986 sequel for the 2015 closing. Gil Kenan’s offering is by no means a travesty and it has some great acting talent on board but it’s not enough to cause a remake celebration and maybe a re-imagining would have been a more fitting semi-original route to take. A guy’s overbearing girlfriend, who he’s afraid to break up with dies in a freak accident. However, she rises from the grave hampering his new relationship. 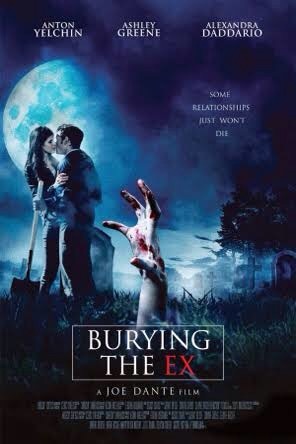 Written by Alan Trezza reminiscent of IZombie, Big, Over Her Dead Body (2008) only with the ghost aspect replaced with a zombie and Death becomes Her to name a few just a few, Burying The Ex has its own inner city charm. Packed with horror references, it’s a genre aficionados dream thanks to Joe Dante’s magic touch, effects, score and on location shoot. Things get interesting when vegan Ashley Greene’s Evelyn returns from the grave and Anton Yelchin as Max tries to juggle his new crush, Olivia (Alexandra Daddario) and possessive ex. Yelchin gives the same great every guy performance as he did in Odd Thomas. Greene steels the show with some good makeup effects, from spewing up embalming fluid to being a drop dead gorgeous psycho corpse. There’s touches of the Howling (1981) with the old reference books and Amazing Stories (1986). Some jokes fall flat, but most of the lines, gross out gags are on the money. There’s some eerie scenes, vileness and blood when Evelyn realises what zombies enjoy. The film then takes a macabre turn in the latter Evil Dead-like half. Dante creates a unique off beat atmosphere as he did with Gremlins and Small Soldiers. While zombies have become stale and saturated lately Dante injects some life in what could have been a Twilight Zone, Monsters, Tales from the Darkside or Crypt anthology episode into a snappy horror comedy film. It’s not John Landis’ American Werewolf but it’s a hoot for old school horror, practical effects fans. Durning the destruction of Krypton a girl is sent to earth to escape and to protect her cousin but when she arrives her mission becomes something very different. In episode one Kara goes undercover becoming a regular person with a few knowing her true powers. There’s a nod to the DC Super franchise with cameos from Dean Cain, Helen Slater and a flash of the Man of Steel himself. While debately not as striking as 1984’s Slater, Melissa Benoist looks far more comfortable in the duel Kara geek/ Supergirl superhero role. Opening with a expository flashback, an explanation of her delay in The Phantom Zone, arriving late to earth it turns out there’s no need to protect Kai-El. And maybe no need for two alien super beings. Its fittingly goofy at times, it’s fun, with some good action setups, it has nice effects for a TV show, the tone is also serious at times reminiscent of the Adrianne Palicki Wonder Woman pilot. After Supergirl reveals herself to the world it gets interesting when her presence has a far more of a rippling effect than her cousins and she’s introduced to an underground alien monitoring organisation. 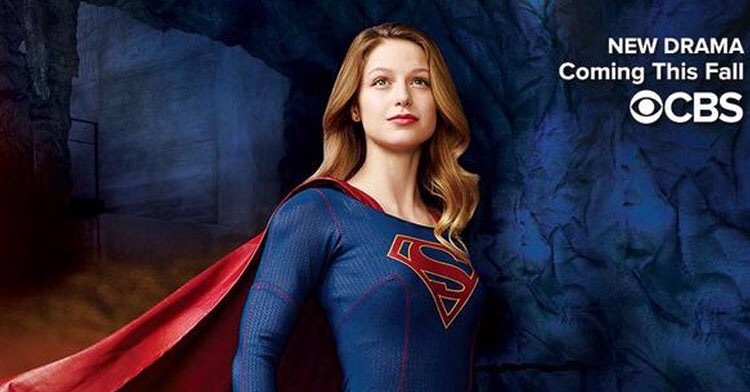 It’s also humorous when Kara begs her boss Calista Flockhart not to coin the ‘Super Girl’ name. There’s some warm scenes with her sister Alex and her mother and it finishes on a teaser with the introduction of her aunty. With a predominantly female cast, it has a positive young vibe and comic book feel, which may give it some longevity in a saturated superhero TV schedule. It’s up, up and okay. Set in a future desert wasteland a woman is hunted down after smuggling out five wives of a cult leader who have been specially selected for breeding aided by a caged slave who is being used as a blood donor. Without drawing comparisons to Gibson and George Miller’s previous three Mad Max outings and the countless cash-in Italian films it spawned what’s clear from the get go is that with some great camera work Miller knows how to give a film a contemporary look and feel while retaining a Mad Max vibe. 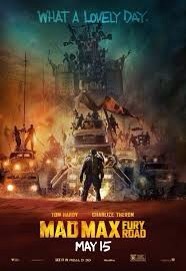 Mad Max Fury Road looks absolutely gorgeous, with sweeping shots of deserts, fitting costumes, great make up, sets and vehicle designs. The sub character are likable and the unlikely alliances formed are interesting. Even though the dialogue is limited there is never a dull moment with some fresh, original, dare I say unique action setups. With people leaping from one car to another using poles reminiscent of giant dune buggy aerials to name just one. It’s one long road trip in a strange, post-apocalyptic world from start to finish with branding, skin tattoos, siren like females and a combination flamethrower/guitarist on a bungee to name a few. Miller, Brendan McCarthy and Nico Lathouris’ basic screenplay has plenty of surprises and it tries to move away from the paint by numbers actioner that have flooded the screens for an age. The acting is solid, Charlize Theron has fantastic presence as the one armed Furiosa, lacking any levity which gives credence to the character who is trying to help a group of women (including Rosie Huntington-Whiteley who also shows she can act) escape for a better life. Tom Hardy is on fine form as the dream and nightmare vision afflicted Max but is on a equal footing with Theron in terms of screen time as they face danger together throughout against rival nomads and the memorable cult leader Joe played menacingly by Keays- Byrne. Nicholas Hoult Nux leaves an impression and characters develop and refreshingly change. Even the eccentric characters and over the top stunts, gun-play and explosions feel grounded because you buy into the world where gasoline and water are scarce. Its not glossy like the Jurassic World nor Terminator Genesys, Fury Road is dusty, gritty, surreal in places, visually impressive entertainment, perfectly executed and more than just another action movie. A 26 year old coding expert wins an opportunity to spend time with a bearded, tetchy, technology genius and his latest experiment, a humanoid robot. Opening with an environment of modern architecture, mod cons and technology in contrast to natures wonderfully filmed mountains and forests Ex Machina is a crisp looking film. Mirroring much of The Machine’s (2013) elements (turing test, similar score, robot conspiracy even the same main characters name) it’s a much different delivered film. Ex Machina is more grounded and a less action orientated Frankenstein tale but like the great low budget aforementioned and the recent Automata (2014) it tackles the relationship between humans and machine. 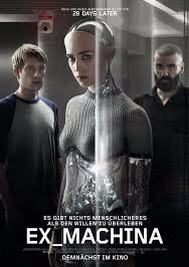 There’s a small ensemble cast with good supporting actors, lead Oscar Isaac is excellent as the dislikable intelligent alcohol fuelled scientist Nathan, Domhnall Gleeson’s Caleb, a student questioning his love for a robot is interesting but the star here is Alicia Vikander as Ava the world’s first artificial intelligent beautiful female robot. Writer/director Alex Garland’s offering is intriguing, with its atmosphere enhanced by a fitting futuristic pulse percussion score by Ben Salisbury and Geoff Barrow which complements its modest, near enough photo real effects. With the facility nestled in the wilderness, a fantastic picturesque location, there’s impressive designed rooms, with great lighting and colour shemes to match. With no outside contact permitted it’s claustrophobic at times as Caleb builds his relationship with Ava and Nathan in the compact mirrored rooms and narrow frosted glass corridors of the mini facility. It’s thought provoking, with tension and some surreal moments. In the closing it becomes a cat and mouse mind game duel with a nice fulfilling twist. Ex Machina has great production values, it’s finely filmed, nicely paced and while not as punchy, conventional or mainstream satisfying as The Machine it has a subtler more stylised polished take on the same theme. A Midwest father ensures he spends time with his a teenage girl who has contracted a disease which will eventually turn her into a zombie. Arnie disposes of a zombie within the first ten minutes then another two before the half hour mark. But this isn’t the frantic pace of many of the contemporary outbreak flicks, it’s pace is the opposite. 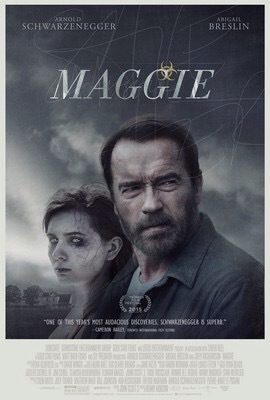 Here Arnold Schwarzenegger doesn’t play Arnold the action hero, he plays a 6 foot odd dad whose daughter has weeks to live and with his neighbours expiring around him the locals want his daughter quarantined. To Schwarzenegger credit it’s a refreshing change of pace and even though he’s done the dishevelled look before, here he gives one of his most deep performances. The Midwest looks ominous thanks to cinematography from Lukas Ettlin. It’s a slow pace character driven piece wonderfully filmed by director Henry Hobson with a muted pallet accompanied by an effective eerie score from David Wingo . As the decay takes hold there’s some effective Icky makeup effects including, cloudy eyes, sores, a severed finger and garbage sink disposal scene. While John Scott III screenplay doesn’t offer the sub genre any great shakes it’s well written and subtle. Grim, touching in places with some creepy dream like images, notably a little dead girl that will give chills, don’t expect Romero or WWZ for a big budget film it captures an elegant indiefilm feel reminiscent of The Battery or Autumn. With a subtext of death, terminal illness, suicide and euthanasia, from the simple things to a kiss on a forehead to flowers in a garden, it’s like watching a film about the Titanic with the inevitable lurking in the shadows. Worth viewing if a change of momentum floats your boat. A debonair art dealer and part time rogue must recover a stolen painting juggling the Russian mob, Mi5 and an international terrorist. To get the most out David Koepp’s Mordecai you probably have to be familiar with the sub- genre crime fiction caper story. Acclaimed screenplay writer Koepp takes up the directing chair in this throwback contemporary set heist caper. 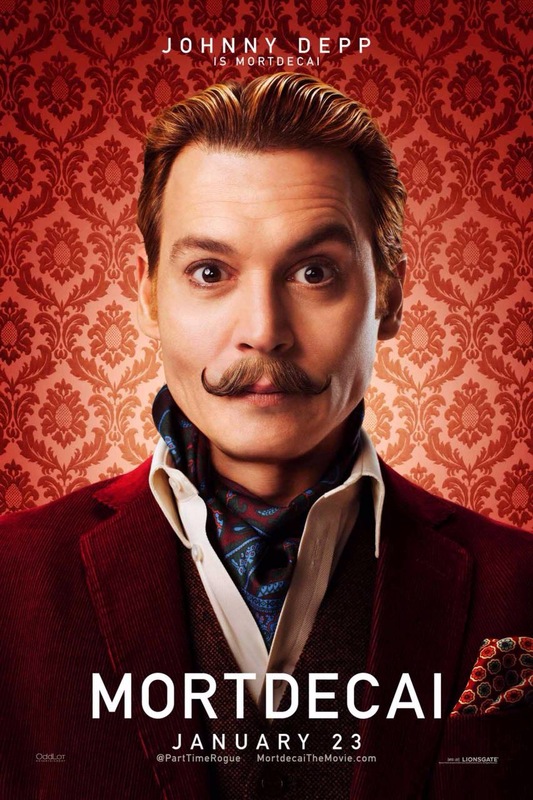 Johnny Depp does his best impression of English comedian and character actor Terry Thomas with a hint of David Niven and Peter Sellers thrown in. Based on Kyril Bonfiglioli novel Eric Aronson screenplay the narrative needless meanders in places, but it’s all good fun especially when Depp seemingly appears to be ad-libbing. As with Depp’s overlooked and debatably unfairly judged The Tourist (2010) which encompassed the spirit of Hitchcock and other classic thrillers Mordecai goes about to do the same. It’s has that British comedic action style that viewers will either appreciate where it’s coming from or they won’t. As a homage it works perfectly, with its ongoing gags, fisticuffs and one liners. There’s some great, set, costumes, global locations and nice comedic action set ups throughout, most of which feature Paul Bettany’s hard man Jock, Mordecai’s Pink Panther’s Kato like man servant. Bettany pulls the character off with ease and brings to life a role that would usually go to a nobody actor. The supporting cast are an array of familiar faces including the likes of UK’s Paul White House doing his worst Italian accent and USA’s Jeff Goldblum to name a few. Gwyneth Paltrow is delightful as the typical aristocrat wife, Ewan McGregor is on form looking as if he’s auditioning for James Bond and curly moustached Depp is a hoot. Granted it’s predicable and some of the gags fall short but Koepp still offers guilty, glitzy fun especially when viewed in the context of the genre its emulating.